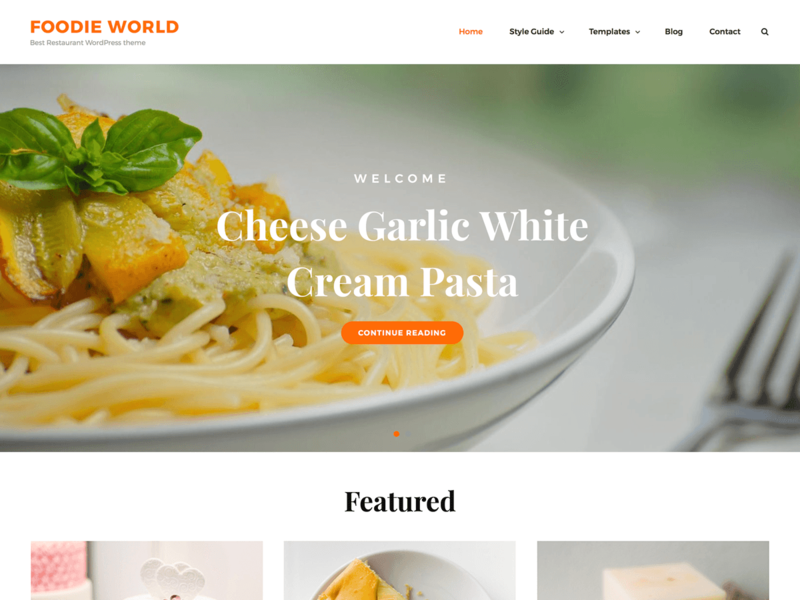 Foodie World is a Free Food & Restaurant WordPress Theme that has been crafted specially to help you create your very own stylish and delicious-looking website in only a few minutes. Foodie World is a clean and fresh-faced free restaurant WordPress theme that has been crafted with minimal design to put your food first. The theme is highly customizable and perfect to show off your cuisine on your website elegantly. Foodie World has a welcoming and engaging appearance with a visually appealing look and simple menu pages. 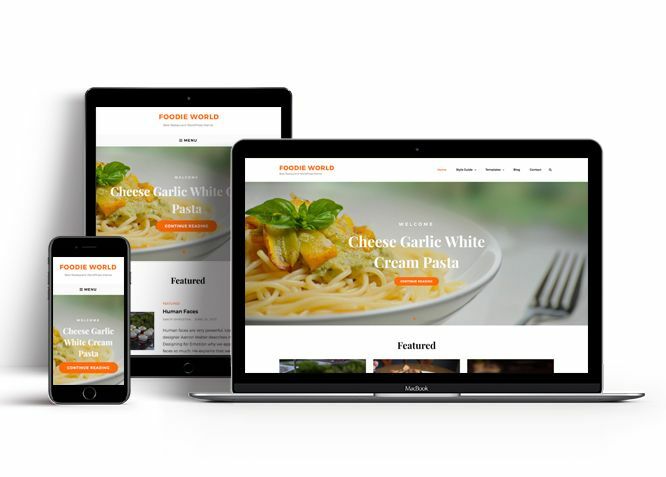 Foodie World is completely responsive and your website looks perfect on all devices. 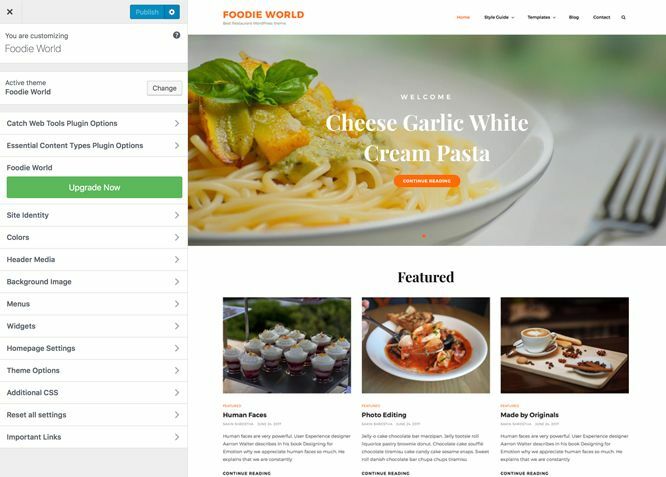 So, if you’re in the hunt for a fresh WordPress theme for your website to show off your restaurant and everything it has to offer, then Foodie World is the perfect one to go for. Also, the theme is translation-ready. For more details, check out Theme Instructions. Foodie World offers exciting Menu Options! This theme supports and recommends using "Custom Menus". You can create Custom Menu through "Appearance => Menus" from your WordPress Dashboard. You can assign your custom menu in 1 locations. You assign it either from "Appearance => Customize => Menus => Manage Location" or from "Appearance => Menus => Manage Location"
To enable featured content, select "Homepage/Frontpage or Entire Site" option under "Enable on"
Foodie World supports Page as Featured Slider. For Featured Slider Options, go to "Appearance => Customize => Theme Options =>Featured Slider". For featured slider go to this linkNote: When you select page, make sure your page have Featured Image. Click here to watch our Video Screencast to add Featured Image. #How to use Food Menu using Custom Post Type? Then go to "Appearance => Customize => Theme Options => Menu Option", select type as Custom Post Type under Menu 1, Menu 2 and so on add your menu sections. Once you are in Layout Options, you can Check the box below "Single Page/Post Image Layout" which will set our posts/page image layout. Further, you have the choice of selecting Single Page/Post Image Layout for individual pages and posts through "Foodie World Options => Single Page/Post Image Layout", which you shall find below individual posts and pages, when you click on them for adding/editing. Foodie World supports Custom Post type's services as services. For services you need install our free plugin need to install Essential Content Type Plugin then, go to "Appearance => Customize => Theme Options => services". Foodie World currently has 4 widgetized (Sidebar) areas thay are: 1. Sidebar, 2. Footer One, 3. Footer Two, 4. Footer Three Go to "Appearance => Widgets" or "Appearance => Customize => Widgets" in WordPress. Foodie World Pro has 1 Widgets to choose from. They are: 1. CT: Social Icons. You can add widget in widget area as per your need.